One key factor is the exterior and interior components made from carbon-fiber. Carbon-fiber is ideal for the manufacture of sportscars as its use allows for weight reduction and improved mechanical features. The car’s performance is thus enhanced thanks to a better weight-to-power ratio and reduced total mass, which means that CO2 emissions are also lower. Lamborghini has been at the forefront in this material’s application for many years, and now the brand is extending its leadership even further. The V10 power unit with 5.2 liters (317,6 cu in) of displacement generates 419 kW (570 CV*) in the Gallardo Superleggera. This puts the weight-to-power ratio of the new top model at only 2.35 kilograms (5.18 lb) per CV and guarantees breathtaking performance. 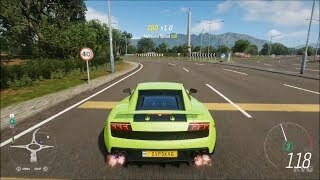 The Gallardo LP 570-4 Superleggera handles the dash from zero to 100 km/h (0-62 mph) in 3.4 seconds and flies past the 200 km/h (124 mph) mark only 10.2 seconds later, ultimately reaching 325 km/h (202 mph). The engine with “Iniezione Diretta Stratificata” gasoline direct injection also boasts an impressive degree of efficiency. Its fuel consumption and CO2 emissions have been reduced by 20,5 percent compared to the previous model. The elegance of every Lamborghini rests on both its extreme power and precise functionality. The Gallardo LP 570-4 Superleggera’s bodyshell is sculptured and completely free from stylistic additions. Dimensions define the contours of a dynamic wedge – 4.39 meters (172,7 in) long, 1.90 meters (74,8 in) wide, but only 1.17 meters (45,9 in) high. Exterior modifications are all directed at increasing aerodynamic effects. Working closely with wind tunnel experts, the designers from Lamborghini’s Centro Stile remodeled the front bumper – three-dimensional, deeply recessed elements form trapezoidal frames for the large air intakes. Together with the V-shaped, sharply defined nose and the LED daytime running lights, the black elements give the front end a razor-sharp look, reminiscent of Lamborghini’s top model. The new design increases the supply of cooling air and improves the downforce on the front axle. The modifications to the fully-covered underbody, which include new sill elements and a redesigned diffuser incorporating four large tailpipes, help to achieve better aerodynamic results. The Gallardo Superleggera sports a small rear spoiler as standard. A big rear spoiler is available as an option. The model on which the Gallardo LP 570-4 Superleggera is based, the Gallardo LP 560-4, is already a prime example of Lamborghini’s lightweight engineering philosophy, with its dry weight of 1410 kilograms (3108.5 lb). Its bodyshell is made from aluminum, with moulded node elements and extruded parts forming an extremely stiff framework into which the aluminum panels are integrated. The spaceframe structure is impact-resistant and forms the basis for the super sportscar’s precise handling. Against this background, the task of reducing the weight by a further 70 kilograms (154 lb) presented a huge challenge to Lamborghini engineers – the target figure, a weight-to-power ratio of 2.35 kilograms (5.18 lb) per CV, sets a new best among the competition. Lamborghini engineers handled the task as they usually do – with hi-tech competence and aesthetic flair. The rear windshield and side windows are made from robust and resistant polycarbonate. The engine cover also includes a polycarbonate window, beneath which the V10 engine is displayed like a technical work of art. The long cover section runs from the roof to the rear of the vehicle and is made from carbon-fiber. Engineers also selected carbon-fiber for the rear spoiler, sills, diffuser, parts of the underbody paneling and the fine exterior mirror casings. With its minimal weight and extremely high rigidity, carbon-fiber is the ideal material for a super sportscar. As far back as the 1980s, Lamborghini was already gathering experience in this field with the Countach. Today, some parts of the Murciélago’s structure are made from carbon-fiber. In order to secure this leading position even further, the brand from Sant’Agata Bolognese established a center of excellence for carbon-fiber materials, where specialists are developing components, working with efficient manufacturing technologies. 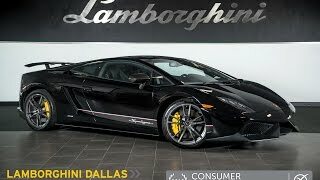 Lamborghini’s carbon-fiber strategy is further proven by its foundation of the “Automobili Lamborghini Advanced Composite Structures Laboratory” (ACSL) at the University of Washington in Seattle, USA. Lamborghini provides support to the facility and its long-term, co-operative research work in the fields of aeronautics and astronautics, together with the composite materials’ application within the automotive sector. Alongside the University of Washington, aircraft company Boeing is also among Lamborghini’s partners. The aircraft manufacturer commands enormous expertise in the field of composite materials. With the new Type 787 Dreamliner, Boeing has developed the world’s first commercial aircraft built entirely from carbon-fibre. Thanks to its superior characteristics, it consumes around 20 percent less fuel than a conventional aeroplane. Altogether, carbon-fiber components make up 40 (88 lb) of the 70 kilograms (154 lb) saved on the Gallardo Superleggera. In the interior, too, engineers aimed to reduce weight as much as possible. The center tunnel cover, the door panels and the surround of the e-gear automated manual transmission lever are made from carbon-fiber. The high-end material is also used for the sports seats’ shells. They make a significant contribution to the overall weight reduction. Just like the rest of the cockpit, the sports seats are clad in lightweight Alcantara instead of leather. 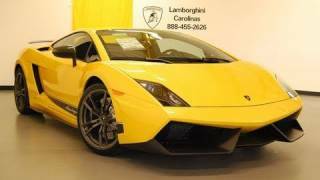 At Lamborghini, weight reduction is in no way synonymous with sacrifice – the Gallardo LP 570-4 Superleggera is still equipped with air conditioning and electric powered windows as standard. Lamborghini has built on this strength – the interior is crafted with passionate attention to the tiniest detail; high quality materials indulge both visually and sensually. The interior, including roof and mats, retains the Lamborghini Gallardo’s black finish. As a contrasting color for elements such as seat trims and stitching, customers can choose among green, yellow, orange and two shades of gray. They match exterior paint finishes in Verde Ithaca, Giallo Midas, Arancio Borealis, Grigio Telesto, Nero Noctis and Bianco Monocerus. In the Gallardo LP 570-4 Superleggera, LP stands for “longitudinale posteriore” and refers to the orientation of the V10 engine – which is mounted longitudinally behind the driver, just like every Lamborghini engine. The number 570 refers to the maximum power output in CV, which equates to 419 kW and is available at 8,000 rpm. Equally impressive is the pulling power – the torque curve peaks at 540 Nm (398,3 ft lbs) at 6,500 rpm. The increase of 7 kW (10 CV) is the result of the new dedicated engine management strategy. The V10 has a displacement of 5204 cm3 and achieves a specific output of 80.5 kW (109.6 CV) per liter. Special features on this long-stroke engine with an aluminum crankcase include dry sump lubrication and a cylinder angle of 90 degrees. Both solutions lower the center of gravity, thus improving the handling dynamics. To ensure an ideal combustion chamber fill, the engine has an adjustable intake manifold and continuous control of the chain-driven camshafts. The crankshaft is conceived as a dual-plane crank – the connecting rods of opposing pistons share one bearing. This configuration delivers alternating ignition intervals of 54 and 90 degrees; a unique sequence that is the reason for the compelling, racing car-like sound of the V10. As the revs rise, resounding bass notes are overlaid with razor sharp harmonics. The powerful V10, combined with the model’s weight reduction, gives the Gallardo Superleggera LP 570-4 breathtaking performance. The car accelerates zero to 100 km/h (0-62 mph) in just 3,4 seconds, 0 to 200 km/h (0-124 mph) in 10,2 seconds – then continues relentlessly to its top speed of 325 km/h (202 mph). The Gallardo Superleggera is also considerably more efficient – compared with its predecessor, its fuel consumption in the EU driving cycle is reduced by 3,5 liters per 100 kilometer (0,9 gal), or 20,5 percent, to 13,5 liters/100 km (16 mpg). This improvement is partly due to the “Iniezione Diretta Stratificata” gasoline direct injection, which injects fuel into the combustion chambers at pressures of up to 100 bar. The tumbling mix cools the combustion chambers, which enables a very high compression ratio of 12.5:1 which, in turn, increases efficiency. The Gallardo LP 570-4 Superleggera comes with the e-gear transmission operated via steering wheel paddles, as standard. The automated system with electronic management shifts through its six gears extremely smoothly and far more quickly than could be achieved by human reflexes. The e-gear control unit has three operating modes, two of which available in automatic. The “Thrust mode” delivers maximum off-the-line performance and is programmed to manage starting revs of around 5000 rpm with minimal wheel slip. Every single kilometer in the new Superleggera is utterly thrilling – not least because of the relentless traction in practically every situation. This is largely attributable to the four driven wheels, as indicated by the number 4 in the model name. The permanent all-wheel drive integrates a central viscous coupling and a 45 percent limited slip differential on the rear axle. In normal circumstances, the power delivered by the V10 is channeled with a ratio of 30:70 to the front and rear axles. The weight distribution of the superlight Gallardo is 43/57 percent front/rear. In 1993, the Diablo VT was the first Italian super sportscar with an all-wheel drive set-up, and Lamborghini has been steadily consolidating its leadership ever since. In fact, thanks to the car’s superior traction, Lamborghini drivers can accelerate earlier out of a bend than drivers of rear-wheel drive cars. The new Gallardo Superleggera is a highly-concentrated driving machine – it thrills with breathtaking cornering speeds and fast, immediate feedback. Its handling is always precise, stable and predictable. The running gear layout is derived directly from Lamborghini’s motorsport experience. The suspension is aluminum double wishbones. The precise rack and pinion steering keeps the driver very closely connected with the road. The shock absorbers are extremely firm, and the anti-roll bars and suspension mounts have been further reinforced: these features enable the running gear to reach its full dynamic potential. No other model in the Gallardo range is as close to a race car as this one. The development of the Superleggera was heavily influenced by experiences gained from the world’s fastest single-brand race series, the Lamborghini Blancpain Super Trofeo. Another special feature of the Gallardo Superleggera is the wheels. The 19-inch units are aluminum forged and are therefore extremely lightweight – saving 13 kilograms (28.6 lb). The wheel bolts are made from titanium and are also incredibly light and rigid. The tires are 235/35 ZR19 at the front and 295/30 ZR19 at the rear and come from the Pirelli P Zero Corsa series. Developed specifically for the new top model in the Gallardo range, they are closely related to pure race rubber. Behind the huge wheels are brakes that serve to deliver uncompromising stopping power and are managed by the standard-fit ESP stability control system. The front wheels are served by aluminum eight-piston calipers, with four-piston units at the rear. The ventilated brake discs have a diameter of 365 and 356 millimeters (ø 14.37 x 1.34 in and 14.02 x 1.26 in) respectively. As an optional extra, Lamborghini can fit extremely fade-resistant and lightweight discs made from carbon-fiber ceramic with six pistons at the front. The front ceramic discs have a diameter of 380 millimeters (ø 15 x 1.5 in). Alongside its specialized carbon-fiber lightweight components, the Lamborghini Gallardo LP 570-4 Superleggera is delivered ex-works with an array of other high-end features. Highlights include the e-gear transmission – a manual gearbox is also available at no additional cost – the dedicated set-up, the Pirelli sports tires and the sports seats. Alcantara upholstery and a hand-stitched steering wheel also set the interior ambiance. The range of special equipment is particularly sporty. It includes carbon-fiber ceramic brake discs, four-point seat belts, fire extinguisher and a steel roll cage. Visual impact can be further increased by a rear spoiler and the engine bay for the engine compartment – both from carbon-fiber – as well as colored brake calipers. For the interior, Lamborghini offers special floor mats and leather steering wheels, a storage package and an alarm system. An additional carbon-fiber package includes center console and instrument panel trim, the parking brake handle, parts of the steering wheel and the door handles. A LED light package illuminates the engine compartment, the interior, and the entry area. Additional features of special equipment increase comfort, such as the multimedia navigation system, the lifting system which raises the front of the car to enable driving over obstacles, a remote control for opening garage doors and a rear view camera mounted beneath the rear spoiler. Customers who want to personalize their Gallardo LP 570-4 Superleggera, can use Lamborghini’s wide-ranging options of the “Ad Personam” individualization program.